What many international observers continue to miss is that the deceleration of growth in China goes hand in hand with rapidly-rising living standards. In his annual work report, Chinese Premier Li Keqiang said on Monday that China aims to expand its economy by around 6.5 percent this year. While some of the leading international media reported the new growth target factually, others portrayed it as a “slowdown” that could even undermine global growth prospects. Much of the international media is missing the real story of Chinese growth. Speaking at People’s Congress (NPC) on Monday, Premier Li Keqiang did say that China’s new growth target is 6.5 percent. At surface, that’s the same as the official target in 2017. Last year, the goal was kept unchanged, even though the economy grew 6.9 percent and exceeded the government’s official target. In a deeper view, the growth target is not the same as in 2017 because the landscape of Chinese growth is changing. In the past, credit growth was almost twice as high as the growth rate. But now China is pressing ahead with a campaign to reduce risks in the financial system. Premier Keqiang’s report left no doubt about the fact that the government’s attention is now firmly fixed on credit risks and higher-quality growth. That’s why China has also cut its budget deficit target for the first time since 2012. Authorities will be more watchful of fiscal spending, even as they avoid excessive tightening – which many Western observers advocate in China, even though that would risk a sharper slowdown. Like too many times before, much of international media mistakes secular, longer-term trends with cyclical, short-term fluctuations. Consequently, they misunderstand the deceleration of Chinese growth as a slowdown, stagnation, or even a hard landing. In reality, deceleration simply reflects the eclipse of the intensive phase of industrialization, which heralds a transition to post-industrial society. The deceleration of growth in China is not some mystical omen of bad things to follow. Rather, it is mainly a sign that Chinese rebalancing is on track. When Industrial Revolution peaked in Britain in the early 19th century, the country experienced a "growth miracle." In the late 19th century, US growth, too, accelerated. As these countries completed their industrialization and began to move toward post-industrial services, growth acceleration gave way to deceleration. Barely a decade ago, China still enjoyed double-digit growth. However, today China’s growth is slowing relative to its past performance. Historically, that is the norm with all industrializing economies, not the exception. What makes China different is its massive scale and the purposeful effort to shift from economic growth to rising living standards. Consequently, as China’s growth rate decelerates, living standards continue to rise – very rapidly, even historically. Along with innovation, thriving consumption is the goal of Chinese rebalancing. Such consumption requires growing living standards, not unsustainable growth. This narrative can be illustrated with the first term of President Xi Jinping and Premier Li Keqiang and their projected next half a decade, assuming the current trend line and peaceful conditions will continue to prevail in the world economy. Between 2012 and 2022, Chinese growth rate could decelerate from 7.9 percent to 5.8 percent. Despite this deceleration, living standards will almost double. In 2012, Chinese GDP per capita was about $11,000. By 2022, it is likely to increase to $20,000 (Figure). During this decade, the compound annual growth rate of per capita incomes could thus be around 6.7 percent in China. Now, let’s compare these results with those of the United States. 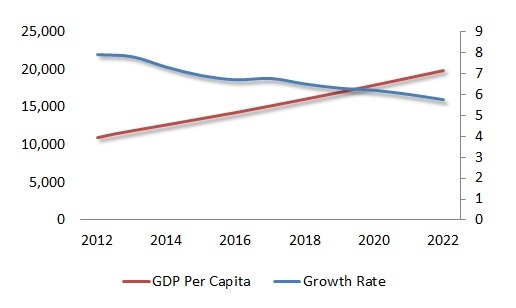 Between 2012 and 2022, US growth rate could decelerate from 2.2 percent to 1.7 percent, while GDP per capita will increase from $50,500 to $57,700 – assuming the country can continue its current leverage-ridden growth. During the time period, the compound annual growth rate of U.S. per capita incomes could thus be around 1.5 percent. Relative to other major advanced economies, that’s pretty good but not relative to China, the largest emerging economy. After all, it is only a fourth of what is projected in China. Oddly enough, when the growth rate of the US economy is slower than anticipated, that’s usually attributed to a “bad quarter.” It is seldom seen as a predictor of U.S. slowdown, collapse or hard landing. In other words, international media seems to have different norms and expectations regarding to China, even though economic realities are pretty clear. Such discrepancies can have distressing implications. While international media systematically highlights mainly downside risks in China and other large emerging economies, it is consistently downplaying the magnitude of leverage-ridden growth and thus downside risks in the U.S. and other major advanced economies.